Some people (mostly men, so it seems) go into hardware stores and see some fancy tool like a compound mitre saw. It’s good to have a compound mitre saw available when you need one, of course. But if you simply charge ahead and start cutting stuff up without a purpose because you can, you’ll end up with a bunch of wood scraps and sawdust everywhere, and maybe with your spouse asking you what happened to the kitchen table. 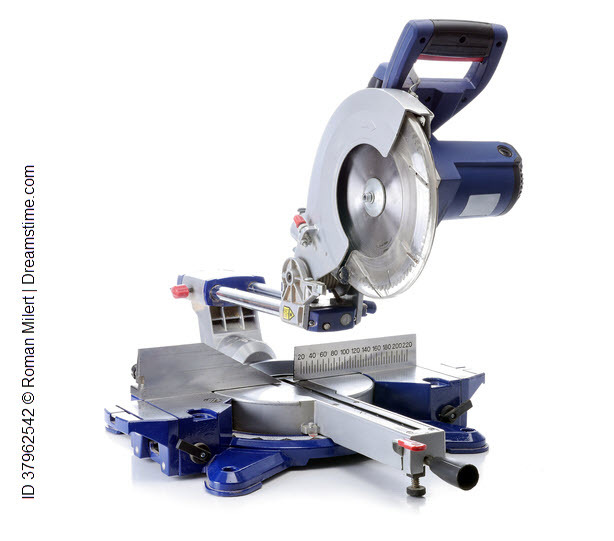 When you’ve got a new tool in your toolbox, remember The Lesson of The Compound Mitre Saw. Instead of asking “What can I automate?”, start testing your product. As you do so, keep a question in the back of your mind: could some tool—a tool that I can make myself!—help me to get this part of the job done? Ask yourself if a tool that you could create would help to enable, extend, enhance, accelerate, intensify, amplify, clarify what you’re doing—at a reasonable cost. If the answer is No because it looks too big or too hard, resist the temptation until you’ve found something that feels more tractable. When the answer is Yes, you’ll know what to automate. Creating little tools, over time, will give you the experience you need to take on the bigger things. Which Test Cases Should I Automate? When someone asks “I have a big suite of manual tests; which tests (or worse, which test cases) should I automate?”, I often worry about several things. The first thing is that focusing on test cases is often a pretty lousy way to think about testing. That’s because test cases are often cast in terms of following an explicit procedure in order to observe a specific result. At best, this confirms that the product can work if someone follows that procedure, and it also assumes that any result unobserved in the course of that procedure and after it is unimportant. The trouble is that there are potentially infinite variations on the procedure, and many factors might make a difference in a test or in its outcome. Will people use the product in only one way? Will this specific data expose a problem? Might other data expose a problem that this data does not? Will a bug appear every time we follow this procedure? The test case often actively suppresses discovery. Test cases are not testing , and bugs don’t follow the test cases. Second: testing is neither manual nor automated. A test cannot be automated. Elements of the procedure within the test (in particular, checks for specific facts) can be automated. But your test is not just the machine performing virtual key presses or comparing an output to some reference. Your test is a process of activity and reasoning: analyzing risk; designing an experiment; performing the experiment; observing what happens before, during, and after the experiment; interpreting the results; and preparing and a relevant report. This depends on your human intentions, your mindset, and your skill set. Tools can help every activity along the way, but the test is something you do, not something the machine does. Third: lots of existing test cases are shallow, pointless, out of date, ponderous, inefficient, cryptic, and unmotivated by risk. Often they are focused on the user interface, a level of the product that is often quite unfriendly to tools. Because the test cases exist, they are often pointlessly repeated, long after they have lost any power to find a bug. Why execute pointless test cases more quickly? It might be a much better idea to create new automated checks that are focused on specific factors of the product, especially at low levels, with the goal of providing quick feedback to the developer. It might be a good idea to prepare those checks as a collaboration between the developer and the tester (or between two developers, one of whom is in the builder’s role, with the other taking on a testing role). It might be a good idea to develop those checks as part of the process of developing some code. And it might be a really good idea to think about tools in a way that goes far beyond faster execution of a test script. What reason do we have for preserving these test cases at all? If we’re going to use tools effectively, why not design checks with tools in mind from the outset? What tool-assisted experiments could we design to help us learn about the product and discover problems in it? What parts of a given experiment could tools accelerate, extend, enhance, enable, or intensify? To what product factors (like data, or sequences, or platforms,…) could we apply tools to help us to induce variation into our testing? How could tools help us to generate representative, valid data and exceptional or pathological data? In experiments that we might perform on the product, how might tools help us make observations and recognize facts that might otherwise escape our notice? How can tools make invisible things visible? How can tools help us to generate lots of outcomes that we can analyze to find interesting patterns in the data? How can tools help us to visualize those outcomes? How could the tool help us to stress out the product; overwhelm it; perturb it; deprive it of things that it needs? How can developers make various parts of the system more amenable to being operated, observed, and evaluated with the help of tools? How might tools induce blindness to problems that we might be able to see without them? What experiments could we perform on the product that we could not perform at all without help from tools? Remember: if your approach to testing is responsible, clever, efficient, and focused on discovering problems that matter, then tools will help you to find problems that matter in an efficient, clever, and responsible way. If you try to “automate” bad testing, you’ll find yourself doing bad testing faster and worse than you’ve ever done it before. Instead of saying, “It is programmed”, we say, “It is automated”. A world of a difference. It occurred to me instantly that it could make a world of difference, so I played with the idea in my head. To me, the substitutions all generated a different perspective and a different feeling from the originals. When we don’t think about it too carefully, “automation” just happens; machines “do” automation. But when we speak of programming, our knowledge and experience remind us that we need people do programming, and that good programming can be hard, and that good programming requires skill. And even good programming is vulnerable to errors and other problems. So by all means, let’s use hardware and software tools skillfully to help us investigate the software we’re building. Let’s write and develop and maintain programs that afford deeper or faster insight into our products (that is, our other programs) and their behaviour. Let’s use and build tools that make data generation, visualisation, analysis, recording, and reporting easier. Let’s not be dazzled by writing programs that simply get the machinery to press its own buttons; let’s talk about how we might use our tools to help us reveal problems and risks that really matter to us and to our clients. And let’s consider the value and the cost and the risk associated with writing more programs when we’re already rationally uncertain about the programs we’ve got. There are many wonderful ways tools can be used to help software testing. Yet, all across industry, tools are poorly applied, which adds terrible waste, confusion, and pain to what is already a hard problem. Why is this so? What can be done? We think the basic problem is a shallow, narrow, and ritualistic approach to tool use. This is encouraged by the pandemic, rarely examined, and absolutely false belief that testing is a mechanical, repetitive process. Good testing, like programming, is instead a challenging intellectual process. Tool use in testing must therefore be mediated by people who understand the complexities of tools and of tests. This is as true for testing as for development, or indeed as it is for any skilled occupation from carpentry to medicine. When we’re building a product, despite everyone’s good intentions, we’re never really clear about what we’re building until we try to build some of it, and then study what we’ve built. Even after that, we’re never sure, so to reduce risk, we must keep studying. For economy, let’s group the processes associated with that study—review, exploration, experimentation, modelling, checking, evaluating, among many others—and call them testing. Whether we’re testing running code or testing ideas about it, testing at every step reveals problems in what we’ve built so far, and in our ideas about what we’ve built. Clever people have the capacity to detect some problems and address them before they become bigger problems. A smart business analyst is aware of unusual exceptions in a workflow, recognizes an omission in the requirements document, and gets it corrected. An experienced designer goes over her design in her head, notices a gap in her model, and refines it. A sharp programmer, pairing with another, realizes that a function is using a data type that will overflow, and points out the problem such that it gets fixed right away. Notice that in each one of these cases, it’s not quite right to say that the business analyst, the designer, or the programmer prevented a problem. It’s more accurate to say that a person detected a little problem and prevented it from becoming a bigger problem. Bug-stuff was there, but a savvy person stomped it while it was an egg or a nymph, before it could hatch or develop into a full-blown cockroach. In order to prevent bigger problems successfully, we have to become expert at detecting the small ones while they’re small. Sometimes we can be clever and anticipate problems, and design our testing to shine light on them. We can build collaboration into our designs, review into our specifications, and pairing into our programming. We can set up static analysis tools that check code for inconsistency with explicit rules. When we’re dealing with running code, testing might take the form of specific procedures for a tester to follow; sometimes it takes the form of explicit conditions to observe; and sometimes it takes the form of automated checks. All of these approaches can help to find problems along the way. It’s a fact that when we’re testing, we don’t always find the problems we set out to find. One reason might be, alas, that the problems have successfully evaded our risk ideas, our procedures, our coverage, and our oracles. But another reason might be that, thanks to people’s diligence, some problems were squashed before they had a chance to encounter our testing for them. Conversely, some problems that we do find are ones that we didn’t anticipate. Instead, we stumble over them. “Stumbling” may sound unappealing until we consider the role that serendipity—accidental or incidental discovery—has played in every aspect of human achievement. So here, I’m not talking about stumbling in terms of clumsiness. Instead, I’m speaking in terms of what we might find, against the odds, through a combination of diligent search, experimentation, openness to discovery, and alertness—as people have stumbled over diamonds, lost manuscripts, new continents, or penicillin. Chance favours the explorer and—as Pasteur pointed out—the prepared mind. If we don’t open our testing to problems where customers could stumble, customers will find those places. Productive stumbling can be extended and amplified by tools. They don’t have to be fancy tools by any means, either. Example: Stuck for a specific idea about risk heuristic, I created some tables of more-or-less randomized data in Excel, and used a Perl script to cover all of the possible values in a four-digit data field. One of those values returned an inappropriate result—one stumble over a gold nugget of a bug. Completely unexpectedly, though, I also stumbled over a sapphire: while scanning quickly through the log file, using a blink oracle: every now and then, a transaction took ten times longer than it should have courtesy of a startling and completely unrelated bug. Example: At a client site, I had a suspicion that a test script contained an unreasonable amount of duplication. I opened the file in a text editor, selected the first line in a data structure, hit the Ctrl-F key, and kept hitting it. I applied a blink oracle again: most of the text didn’t change at all; tiny patches, representing a handful of variables flickered. Within a few seconds I had discovered that the script wasn’t really doing anything significant except trying the same thing with different numbers. More importantly, I discovered that the tester needed real help in learning how to create flexible, powerful, and maintainable test code. Example: Another colleague, testing the same program, used Excel to generate all of the possible values for one of the input fields. From this he determined that the program was interpreting input strings in ways that, once again, I had never considered. Just this test and the previous one revealed information that exploded my five-line description of the program into fifteen far more detailed lines, laden with surprises and exceptions. One of these lines represents a dangerous and subtle gotcha in the programming language’s standard libraries. All this learning came from a program that is, at its core, only two lines of code! What might we learn about a program that’s two million lines of code? Example: In this series of posts on oracles, I’ve already recounted the tale of how James took data from hundreds of test runs, and used Excel’s conditional formatting feature to visualize the logged results. The visualizations instantly highlighted patterns that raised questions about the behaviour of a product, questions that fed back into refinements of the requirements and design decisions. Example: While developing a tool to simulate multi-step transactions in a banking application, I discovered that the order in which the steps were performed had a significant impact on the bank’s profit on the overall transaction. This is only one instance of a pattern I’ve seen over and over again: while developing the infrastructure to perform checking, I stumble over bug after bug in the application to be tested. Subsequently, after the bugs are fixed and the product is stabilized and carefully maintained, the checks—despite their value as change detectors—don’t reveal bugs. Most of the value of the checks gets cashed in the testing activity that produces them. Example: James performed 3000 identical queries on eBay; one query every two or three seconds. He expected random variation over time (i.e. a “drunkard’s walk”). Instead, the visualization allowed him to see suspicious repeating jumps and drops that looked anything but random. Analysis determined that he was probably seeing the effects of many servers responding to his query—some of which occasionally failed to contribute results before timing out. These examples show how we can use tools powerfully: to generate data sets and increase coverage, so that we can bring specific conditions to our attention; to amplify signals amidst the noise; to highlight subtle patterns and make them clearly visible; to afford observation of things that we never expected to see; to perturb or stress the system such that rare or hidden problems become perceptible. The traditional view of an oracle is an ostensibly “correct” reference that we can compare to the output from the program. A common view of test automation is using a tool to act like a robotic and unimaginative user to produce output to be checked against a reference oracle. A pervasive view of testing is nothing more than simple output checking, focused on getting right answers and ignoring the value of raising important new questions. In Rapid Software Testing, we think this is too narrow and limiting a view of oracles, of automation, and of testing itself. Testing is exploring a product and experimenting with it, so that we can learn about it, discover surprising things, and help our clients evaluate whether the product they’ve got is the product they want. Automated checking is only one way in which we can use tools to aid in our exploration, and to shine light on the product—and excellent automated checking depends on exploratory work to help us decide what might be interesting to check and to help us to refine our oracles. An oracle is any means—a feeling, principle, person, mechanism, or artifact—by which we might recognize a problem that we encounter during testing. And oracles have another role to play, which I’ll talk about in the last post in this long series. Try asking testers how they recognize problems. Many will respond that they compare the product to its specification, and when they see an inconsistency between the product and its specification, they report a bug. Others will talk about creating and running automated checks, using tools to compare output from the product to specific, pre-determined, expected results; when the product produces a result inconsistent with expectations, the check identifies a bug which the tester then reports to the developer or manager. It might be tempting to think of this as moving from the bottom right quadrant on this table to the bottom left. Traditional talk about oracles refers almost exclusively to references. W.E. Howden, who introduced “oracle” as a term of testing art, said that an oracle as “an external mechanism which can be used to check test output for correctness”. Yet thinking of oracles in terms of correctness leads to some pretty serious problems. (I’ve outlined some of them here). In the Rapid Software Testing namespace, we take a different, broader view of oracles. Rather than focusing on correctness, we focus on problems: an oracle is a means by which we recognize a problem when we encounter one during testing. Checking for correctness, as Howden puts it, may severely limit our capacity to notice many kinds of problems. A product or service can be correct with respect to some principle, but have plenty of problems that aren’t identified by that principle; and a product can produce incorrect results without the incorrectness representing a problem for anyone. When testers fixate on documented requirements, there’s a risk that they will restrict their attention to looking for inconsistencies with specific claims; when testers fixate on automated checks, there’s a risk that they will restrict their focus to inconsistency with a comparable algorithm. Focus your attention too narrowly on a particular oracle—or a particular class of oracle—and you can be confident of one thing: you’ll miss lots of bugs. Documents and tools are media. In the most general sense, “medium” is descriptive of something in between, like “small” and “large”. But “medium” as a noun, a medium, can be between lots of things. A communication medium like radio sits between performers and an audience; a psychic medium, so the claim goes, provides a bridge between a person and the spirit world; when people want to exchange things of value, they use often use money as a medium for the exchange. Marshall McLuhan, an early and influential media theorist, said that a medium is anything that humans create or use to effect change. Media are tools, technologies that people use to extend, enhance, enable, accelerate, or intensify human capabilities. Extension is the most obvious and prominent effect of media. Most people think of media in terms of communications media. A medium can certainly be printed pages or television screens that enable messages to be conveyed from one person to another. McLuhan viewed the phonetic alphabet as a technology—a medium that extended the range of speech over great distances and accelerated its transmission. But a cup of coffee is a medium too; it extends alertness and wakefulness, and when consumed socially with others, it can extend conversation and friendliness. Media, placed between a product and our observation of it, extend our capacity to recognize bugs. When we pay attention, we can easily observe media overheating both in talk about testing and development work and in the work itself. Documents and tools frequently dominate conversations. In some organizations, a problem won’t be considered a bug unless it is inconsistent with an explicit statement in a specification or requirements document. Yet documents are only partial representations, subsets, of what people claim to have known or believed at some point in time, and times change. In some places, testing work is dominated by automated checking. Checks can be very valuable, providing great precision and fast feedback. But checks may focus on functional aspects of the product, and less on other parafunctional attributes. McLuhan’s work emphasizes that media are essentially neutral, agnostic to our purposes. It is our engagement with media that produces good or bad outcomes—good and bad outcomes. Perhaps the most important implication of McLuhan’s work is that media amplify whatever we are. If we’re fabulous testers, our tools extend our capabilities, helping us to be even more fabulous. But if we’re incompetent, tools extend our incompetence, allowing us to do bad testing faster and worse than we’ve ever been able to do it before. To the degee that we are inclined to avoid conflict and arguments, we will use documents to help us avoid conflict and arguments; to the degree that we are inclined to welcome discussion and the refinement of ideas, then documents can help us do that. If we are disposed to be alert to a wide range of problems, automated checks will help us as we diversify our scope; if we are oblivious to certain kinds of problems in the product, automated checks will amplify our oblivion. 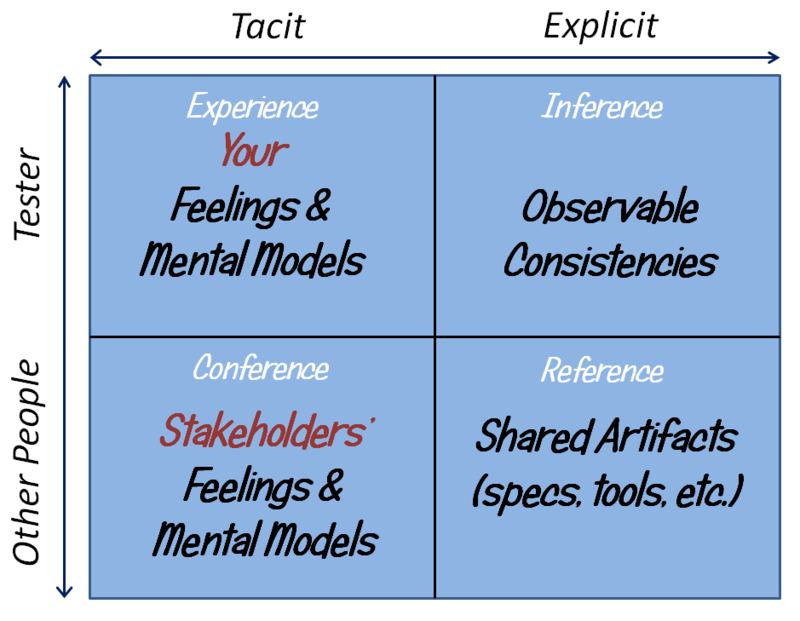 Reference oracles—documents, checking tools, representative data, comparable products—are unquestionably media, extending all of the other kinds of oracles: private and shared mental models, both private and shared feelings, conversations with others, and principles of consistency. How can we evaluate them? What do we use them for? And how can we use them to help us find problems without letting them overwhelm or displace all the other ways we might have of finding problems? That’s the subject of the next post. Sounds ridiculous, doesn’t it? It should. People often make a distinction between “automated” and “exploratory” testing. This is like the distinction between “red” cars and “family” cars. That is, “red” (colour) and “family” (some notion of purpose) are in orthogonal categories. A car can be one colour or another irrespective of its purpose, and a car can be used for a particular purpose irrespective of its colour. Testing, whether exploratory or not, can make heavy or light use of tools. Testing, whether it entails the use of tools or not, can be highly scripted or highly exploratory. “Exploratory” testing is not “manual” testing. “Manual” isn’t a useful word for describing software testing in any case. When you’re testing, it’s not the hands that do the testing, any more than when you’re riding a pedal bike it’s the feet that do the bike-riding. The brain does the testing; the hands, at best, provide one means of input and interaction with the thing we’re testing. And not even “manual” testing is manual in the sense of being tool- or machinery-free. You do you use a computer when you’re testing, don’t you? Some people think of test automation in terms of a robot that pounds on virtual keys more quickly, more reliably, and more deterministically than a human could. That’s certainly one potential notion of test automation, but it’s very limiting. That traditional view of test automation focuses on performing checks, but that’s not the only way in which automation can help testing. In the Rapid Software Testing class, James Bach and I suggest a more expansive view of test automation: any use of (software- or hardware-based) tools to support testing. This helps keeps us open to the idea that machines can help us with almost any of the mimeomorphic, non-sapient aspects of testing, so that we can focus on and add power to the polimorphic, sapient aspects. Exploration is polimorphic activity, but it can include and be supported by mimeomorphic actions. Cem Kaner and Doug Hoffman take a similar tack: exploratory test automation is “computer-assisted testing that supports learning of new information about the quality of the software under test.” Learning new information is one of the hallmarks of exploratory testing, which usually points towards emphasizing variation rather than repetition. That said, there can be a role for mechanized repetition, even when you’re using a highly exploratory approach: when repeating aspects of the test are intended to support discovery of something new or surprising. The key is not whether you’re mechanizing the activity. The key is what happens at the end of the activity. The less the results of one activity are permitted to inform the next, the more scripted the approach. If the repetition is part of a learning loop—a cycle of probing, discovering, investigating, and interpreting—that feeds back on itself immediately, then the approach is exploratory. James has also posted a number of motivations for repeating tests. Each one can (with the possible exception of “avoidance or indifference”) be entirely consistent with and supportive of exploration. There are some actions that tools can perform better than humans, as long as the action doesn’t require human judgment or wisdom. Humanity can even get in the way of some desirable outcome. For example, when your exploration of some aspect of a product is based on statistical analysis, and randomization is part of the test design, it’s important to remember that people are downright lousy at generating randomized data. Even when people believe that they’re choosing numbers at random, there are underlying (and usually quite unconscious) patterns and biases that inform their choices. If you want random numbers, tools can help. Tools can support exploration in plenty of other ways: data generation, system configuration; simulation; logging and video capture; probes that examine the internal state of the system; oracles that detect certain kinds of error conditions in a product or generate plausible results for comparison; visualization of data sets, key elements to observe, relationships, or timing; recording and reporting of test activity. All of this activity happened in a highly exploratory way; each of the activities interacted with the others. I used very rapid cycles of looking at what I needed to learn next about the application, experimenting with and performing tests, programming, asking questions of subject matter experts and programmers and managers, reporting, reading reference documentation, debugging, and learning. Tight loops of activities happening in parallel are what characterize exploratory processes. Yet this was not tool-free work; tools were absolutely central to my exploration of the product, to my learning about it, and to the mission of finding bugs. Indeed, without the tools, I would have had much more limited ideas about what could be tested, and how it could be tested. The explorers of old used tools: compasses and astrolabes, maps and charts, ropes and pulleys, ships and wagons. These days, software testers explore applications by using mind-mapping software and text editors; spreadsheets and calculators; data generation tools and search engines; scripting tools and automation frameworks. The concept that characterizes exploratory testing is not the input mechanism, which can be fingers on a keyboard, tables of data pumped into the program via API calls, bits delivered through the network, signals from a variable voltage controller. Exploratory testing is about the way you work, and the extent to which test design, test execution, and learning support and reinforce each other. Tools are often a critical part of that process. Can Exploratory Testing Be Automated? Exploratory software testing is a style of software testing that emphasizes the personal freedom and responsibility of the individual tester to continually optimize the value of her work by treating test-related learning, test design, test execution, and test result interpretation as mutually supportive activities that run in parallel throughout the project. If we take this definition of exploratory testing, we see that it’s not a thing that a person does, so much as a way that a person does it. An exploratory approach emphasizes the individual tester, and his/her freedom and responsibility. The definition identifies design, interpretation, and learning as key elements of an exploratory approach. None of these are things that we associate with machines or automation, except in terms of automation as a medium in the McLuhan sense: an extension (or enablement, or enhancement, or acceleration, or intensification) of human capabilities. The machine to a great degree handles the execution part, but the work in getting the machine to do it is governed by exploratory—not scripted—work. Which brings us to the second way of looking at the question: can an exploratory approach include automation? The answer there is absolutely Yes. Some people might have a problem with the idea, because of a parsimonious view of what test automation is, or does. To some, test automation is “getting the machine to perform the test”. I call that checking. I prefer to think of test automation in terms of what we say in the Rapid Software Testing course: test automation is any use of tools to support testing. If yes then up to what extent? While I do exploration (investigation) on a product, I do whatever comes to my mind by thinking in reverse direction as how this piece of functionality would break? I am not sure if my approach is correct but so far it’s been working for me. That’s certainly one way of applying the idea. Note that when you think in a reverse direction, you’re not following a script. “Thinking backwards” isn’t an algorithm; it’s a heuristic approach that you apply and that you interact with. Yet there’s more to test automation than breaking. I like your use of “investigation”, which to me suggests that you can use automation in any way to assist learning something about the program. I read somewhere on Shrini Kulkarni’s blog that automating exploratory testing is an oxymoron, is it so? In the first sense of the question, Yes, it is an oxymoron. Machines can do checking, but they can’t do testing, because they’re missing the ability to evaluate. Here, I don’t mean “evaluation” in the sense of performing a calculation and setting a bit. I mean evaluation in the sense of making a determination about what people value; what they might choose or prefer. In the second way of interpreting the question, automating exploratory testing is impossible—but using automation as part of an exploratory process is entirely possible. Moreover, it can be exceedingly powerful, about which more below. I see a general perception among junior testers (even among ignorant seniors) that in exploratory testing, there are no scripts (read test cases) to follow but first version of the definition i.e. “simultaneous test design, test execution, and learning” talks about test design also, which I have been following by writing basic test cases, building my understanding and then observing the application’s behavior once it is done, I move back to update the test cases and this continues till stakeholders agree with state of the application. Please guide if it is what you call exploratory testing or my understanding of exploratory testing needs modifications. That is an exploratory process, isn’t it? Let’s use the rubric of Kaner’s definition: it’s a style of working; it emphasizes your freedom and responsibility; it’s focused on optimizing the quality of your work; it treats design, execution, interpretation, and learning in a mutually supportive way; and it continues throughout the project. Yet it seems that the focus of what you’re trying to get to is a set of checks. Automation-assisted exploration can be very good for that, but it can be good for so much more besides. So, modification? No, probably not much, so it seems. Expansion, maybe. Let me give you an example. Test-driven development is an exploratory process. The running of the checks is not an exploratory process; that’s entirely scripted. But the design of the checks, the interpretation of the checks, the learning derived from the checks, the looping back into more design or coding of either program code or test code, or of interactive tests that don’t rely on automation so much: that’s all exploratory stuff. The program that I wrote is a kind of puzzle that requires class participants to test and reverse-engineer what the program does. That’s an exploratory process; there aren’t scripted approaches to reverse engineering something, because the first unexpected piece of information derails the script. In workshopping this program with colleagues, one in particular—James Lyndsay—got curious about something that he saw. Curiosity can’t be automated. He decided to generate some test values to refine what he had discovered in earlier exploration. Sapient decisions can’t be automated. He used Excel, which is a powerful test automation tool, when you use it to support testing. He invented a couple of formulas. Invention can’t be automated. The formulas allowed Excel to generate a great big table. The actual generation of the data can be automated. He took that data from Excel, and used the Windows clipboard to throw the data against the input mechanism of the puzzle. Sending the output of one program to the input of another can be automated. The puzzle, as I wrote it, generates a log file automatically. Output logging can be automated. James noticed the logs without me telling him about them. Noticing can’t be automated. Since the program had just put out 256 lines of output, James scanned it with his eyes, looking for patterns in the output. Looking for specific patterns and noticing them can’t be automated unless and until you know what to look for, BUT automation can help to reveal hitherto unnoticed patterns by changing the context of your observation. James decided that the output he was observing was very interesting. Deciding whether something is interesting can’t be automated. James could have filtered the output by grepping for other instance of that pattern. Searching for a pattern, using regular expressions, is something that can be automated. James instead decided that a visual scan was fast enough and valuable enough for the task at hand. Evaluation of cost and value, and making decisions about them, can’t be automated. He discovered the answer to the puzzle that I had expressed in the program… and he identified results that blew my mind—ways in which the program was interpreting data in a way that was entirely correct, but far beyond my model of what I thought the program did. Learning can’t be automated. Yet there is no way that we would have learned this so quickly without automation. The automation didn’t do the exploration on its own; instead, automation super-charged our exploration. There were no automated checks in the testing that we did, so no automation in the record-and-playback sense, no automation in the expected/predicted result sense. Since then, I’ve done much more investigation of that seemingly simple puzzle, in which I’ve fed back what I’ve learned into more testing, using variations on James’ technique to explore the input and output space a lot more. And I’ve discovered that the program is far more complex than I could have imagined. So: is that automating exploratory testing? I don’t think so. Is that using automation to assist an exploratory process? Absolutely. …and those are just a few. Thank you, Rahul, for the question. Questions from Listeners (2): Is Unit Testing Automated?